Left to right, back row: Melvin Bradbury, Peter Calcraft, Gerald Coy, Mary Calcraft, Ann Calcraft, Roger (evacuee) and Peter Robinson. 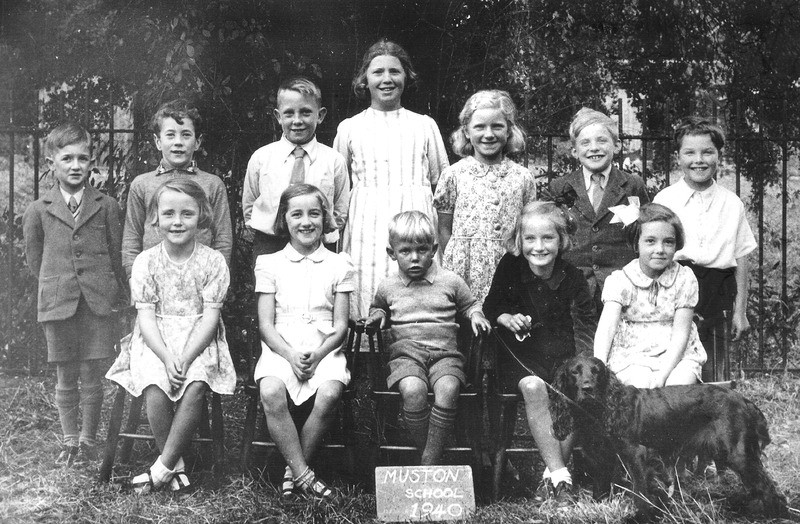 Front row, left to right: Elizabeth Topps, Muriel Hodgkinson, Jolly Weatherall, Jill Carrington, Christine (unknown surname) and the teacher’s dog. This page was added on 08/09/2013. Thanks to Melvin Bradbury, who was also able to tell us the names of his classmates and add that the teacher’s name was Mrs Brown. Christine, front row right, was the teacher’s cousin. Peter Calcraft lived in Sedgebrook. What a lovely photograph! I believe that Jill Carrington is my cousin and we both shared the same grand-mother, Florence Maud Carrington (1882-1973). I also believe that Jill married a Sydney Flick, so if anyone knows whether Jill or any of her family members are still in the Bottesford area I would love to hear from them, as I live close by in Nottingham. Katy and I and family are thrilled to hear about your publication in Natural Bridge! Congratulations Dave. Very well done. There will be many new subscriptions to Natural Bridge in the coming days. Lots of love, Dan, Katy, Molly, and Charlie. PS we are Skyping right now as we write it on the website, so it is really from all of us. I was friends with Ann Calcraft and my mum was a good friend of Ann’s mum! Ann’s father was a postman and died of TB. Mrs Calcraft sat with me during my mother’s very painful birth of my sister, Gill, at the old cottage at The Nook. That baby, incidentally, was over 11 lbs and was born without any kind of painkillers for my Mom. There were only dim oil lamps for the doctor to see by. He was a locum who was filling in for Dr Rankin, who had a broken arm. At one time my grandfather had to make a decision on who he had to save, as Gill’s shoulders were firmly stuck in the birth canal!!! My grandfather opted for my mother, and after a long period, this magnificent doctor returned wringing wet with perspiration and said they had both made it!!! That doctor was brilliant, but also an alcoholic and we heard, several months later, that he had died in a car crash, bless him! The teacher was my grandfather’s sister, Caroline (Carrie) Brown nee Miller (born 1891 in Bottesford). My mother told me that she always had the dog with her and it sat under the desk during lessons. Caroline Brown’s daughter, Beryl, was born in about 1923 and is still alive and living in Cromer. Ann Calcraft (presumably of Syke Lane farm) was cousin to my father. My father was born at the farm, but his father died young so the family had to move out and let his brother Albert take over the farm. Therefore I believed Ann’s father, Albert, to be a farmer and I didn’t know he died of TB. I was born in 1960 and can remember him sitting in his chair in the farmhouse kitchen.